After quite a bit of driving over the weekend to visit my dad and sister’s family in Phoenixville, Betsy and I were in the mood for a short drive on Monday. Just what the doctor ordered, a 102 mile drive that would take us a little less than two hours to accomplish. After navigating that same sketchy road from the campground back to the interstate it was a piece of cake. Less than 2 miles from our exit on I-80 and we arrived at the Bellefonte / State College KOA. It resembled many other KOA’s we’ve visited in the past. Read our official review here. After surveying the park and with a little assistance from the lady working in the office we eased into our pull-thru patio site with all of the amenities; swing, Weber grill, wood table w/ four chairs, and a stamped concrete patio, of course. Even though the forecast was for chilly weather, and we probably would not get to enjoy our amenities, we still considered it a nice site to call home for a couple of days. After getting things set up (we’re really back in the swing of this now! ), we confirmed our plans to get together with my cousin who lives in State College, Bonnie. We met at her house, chatting for a bit. I even got to talk to her sister, and another one of my favorite cousins. Hi PJ! We continued our non-stop chatting at Duffy’s Tavern in Boalsburg over a tasty dinner. After hugs, good-byes, and the requisite picture (We took one didn't we, Bonnie? We can't find it on our camera roll, anywhere?? ), we headed over to catch up with my older brother, Denny, and his wife Judy. Not only is he my older brother, he is the eldest of my six siblings. Sorry Denny, just stating the facts, man! More lively conversation ensued over coffee, cookies (Gluten free for me, of course! Thanks Judy!) and a quick tour of their building. Our night ended as many do, relaxing in Charlie with the fireplace on! We started Wednesday morning a little slow with a late breakfast and expresso to combat the northern PA chill. 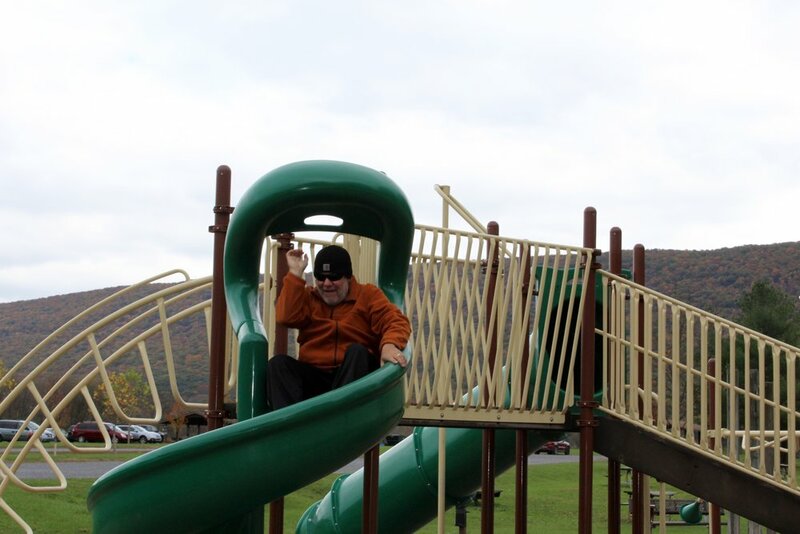 When we did venture outside we made our way to a State Park that Denny and Judy enjoy on a regular basis. Bald Eagle State Park is a 5,900-acre Pennsylvania state park in Centre County. The park includes the Foster Joseph Sayers Reservoir, formed by damming Bald Eagle Creek and other smaller streams and covering 1,730 acres. We enjoyed exploring the park’s marina, lodge, campground and beautiful scenery. The campground sites were typical state park roomy but only had a handful of sites with full hook ups. Full hook ups certainly aren’t a requirement for us, but it sure makes life easy! After surveying the state park we headed for another of Denny and Judy’s recommendations, Twin Kiss! No, this has nothing to do with twins or kissing, but rather highly regarded milkshakes and flurries. That was enough for us, we were there. Well, my peanut butter milkshake and Betsy’s cookies and cream flurry did not disappoint. Time to head home for a nap! Denny and Judy stopped in for another short visit that evening after a trip to Pittsburgh during the day. Some more laughs and good conversation was the end to a pretty good day. And again, we fail to have any photos with you guys. Next time photos are a MUST! But wait, our pretty good day was about to get even better. 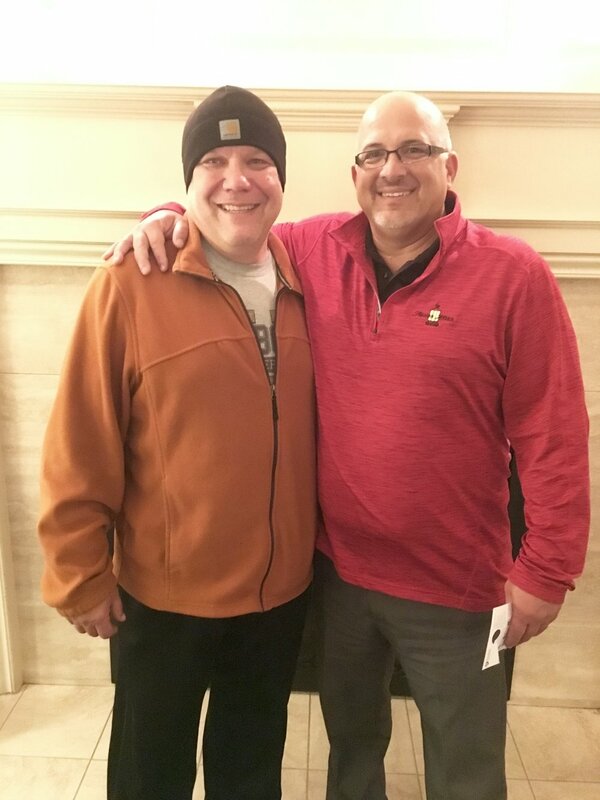 Through the magic of social media, and John Finegan’s expert observational skills, I was made aware that a good high school friend of mine, Joe Gallucci, was in State College for the evening on business. Shoes, coats and hats back on, Betsy and I headed towards State College, more specifically, the Nittany Lion Inn. We found Joe in the hotel restaurant/bar, the first place we looked! We enjoyed a couple of hours of good conversation and catching up with Joe before more hugs, good byes, and yes, another photo! I would like to point out that Betsy, OSU Buckeye fan extraordinaire, was at the Nittany Lion Inn, on the campus of Penn State, exactly three days before the big PSU-OSU football game. But, if you remember the results of the game played that Saturday, she didn’t cause any OSU damage. Ok, it may have been the fact that she was holding a buckeye nut in her pocket the entirety of our visit on campus. A buckeye nut she found in Bar Harbor, ME earlier this summer. Sometimes you can’t even make this stuff up! Obviously I saved the most important fact from our visit to the end. On January 12, 1967 at the Centre County Hospital I started my time on earth. Ok, now the disappointing part. The hospital is no longer a hospital, and there isn’t even any type of historical marker to identify where this blessed event happened. Oh well, I know it happened and now you all know also, so I’m good with that. Tomorrow our travels will take us out of the Keystone State, into its westerly neighbor, the Buckeye State.